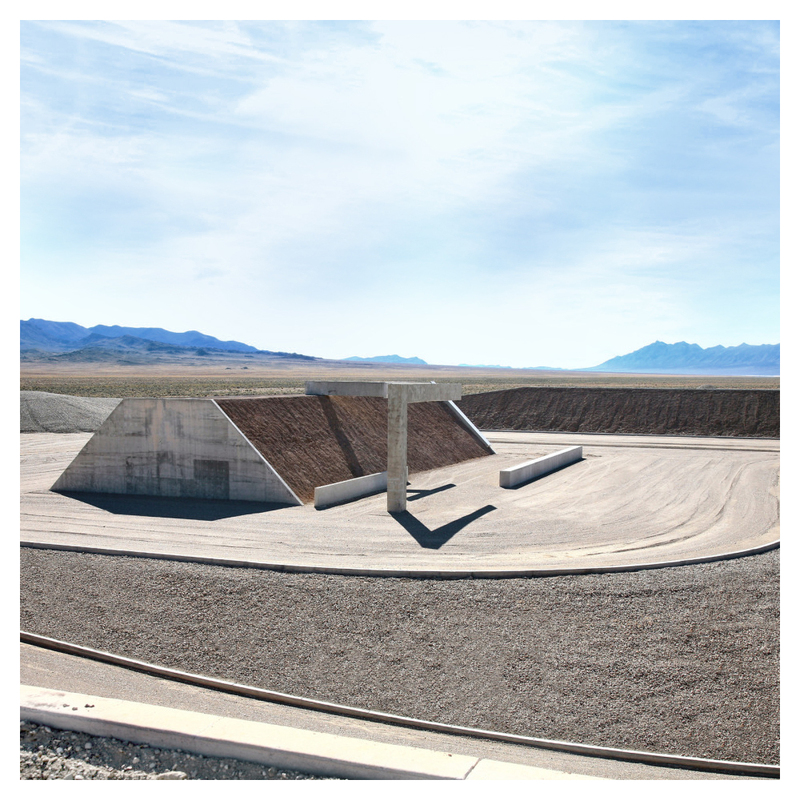 This first Top 10 list highlights my favorite pieces of earthworks, environmental, and land art. 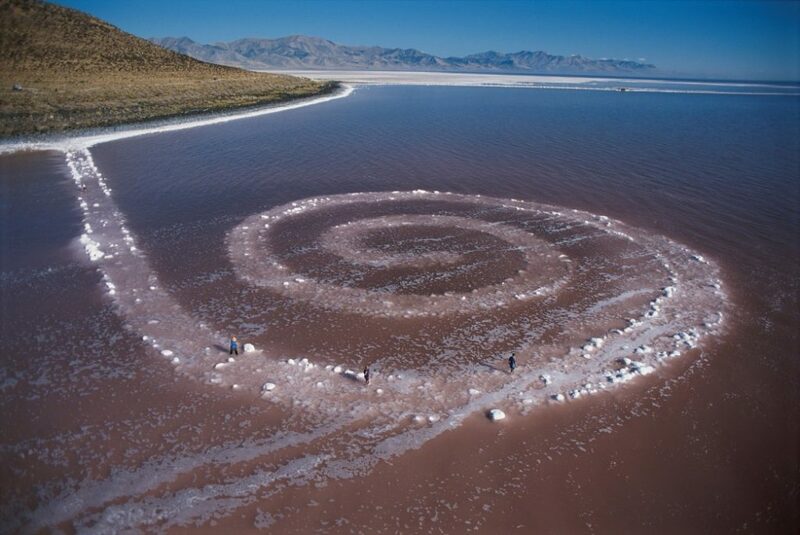 For me, this type of art is transformative due to its scale and its disruption of the landscape. The pieces on my list have allowed me to feel the smallness of my humanity, which has led me to a place of introspection and self-awareness. 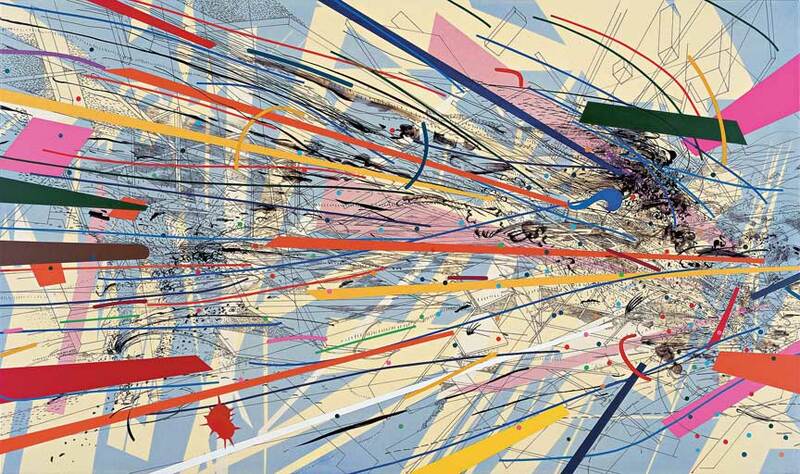 These same pieces have allowed me to recognize the transformative power of art. Because of the focus and dedication to their craft, many of these artists have spent years, if not lifetimes, living and building their art, and these artists, these pieces, inspire me to keep discovering. 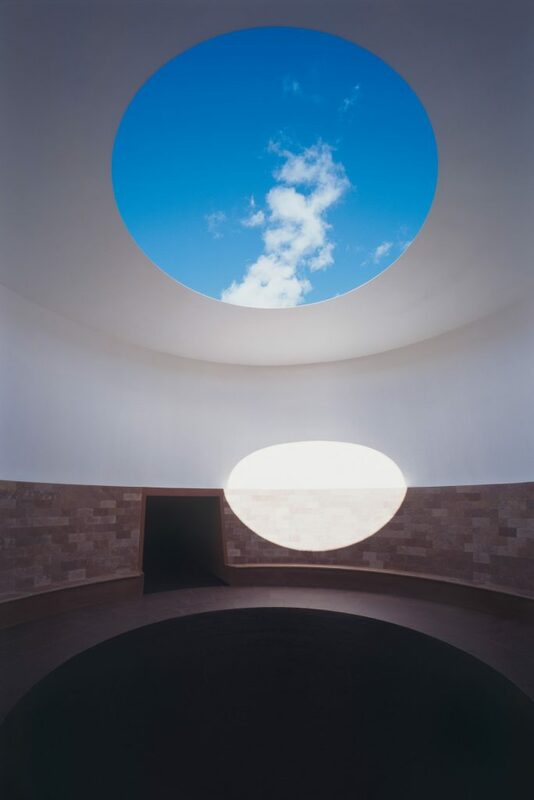 One of my all-time favorite land artists is James Turrell. 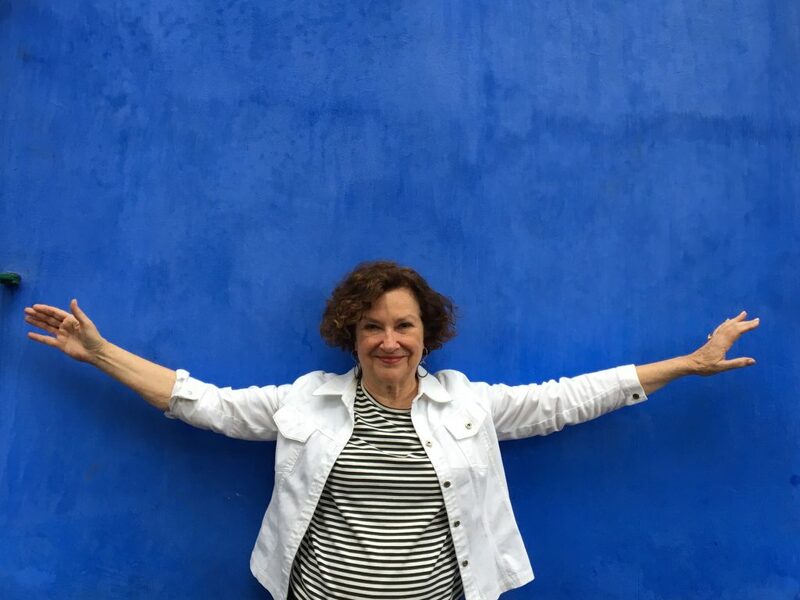 I first became acquainted with Turrell’s work when my friend, Elizabeth, invited me to visit her hometown of Pittsburgh in 1999. 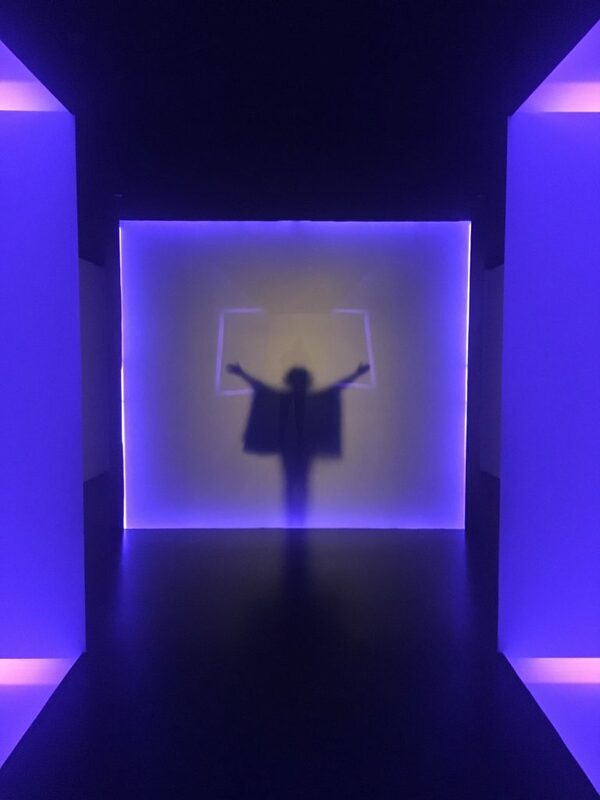 We went to an exhibit at the Mattress Factory where I was able to encounter one of Turrell’s skyscapes in the flesh. It changed the way I saw space, light, art and the world forever. After that experience, I set a goal to see all of Turrell’s pieces, wherever it led, all over the world. 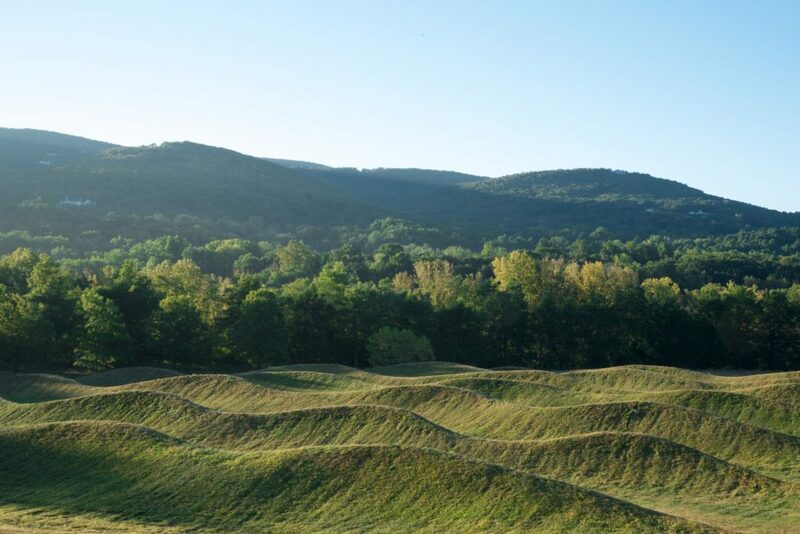 James Turrell’s work led me to discover, and seek out, other artists who traded their paint brushes for tractors in order to create art in, and within, a natural landscape that did not, and could not, confine their vision. Here are my Top 10 favorite pieces. I encourage you to grab a pickup truck or at least a four-wheel drive and seek these out on your own. I guarantee that you will not be disappointed. Have fun! 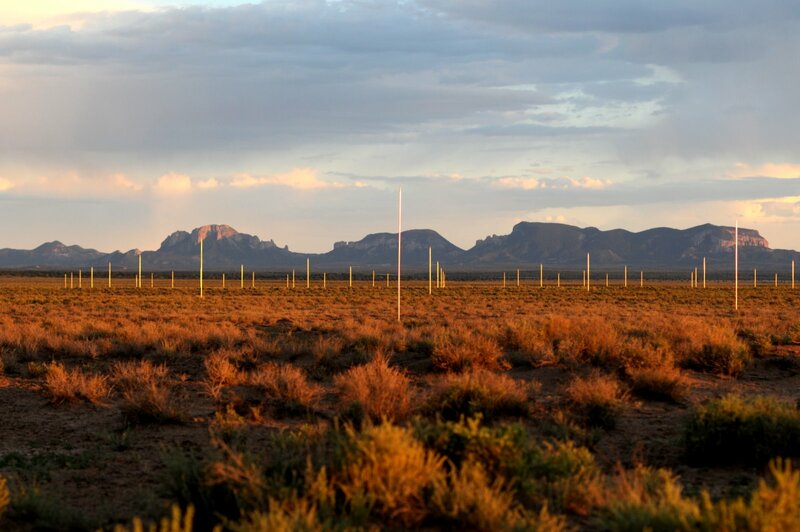 An immersive, massive sculpture (1 mile X 1 meter) located in the isolated, high desert of New Mexico. An experience with light that proved life-changing for me. Very difficult to find even with the best directions but “getting lost” is part of the wonder. Reductive, gouged earth that feels like a narrow street in an ancient city or that of a cathedral. Either way, I experienced a sense of awe as I tried to understand my place in the world. Walking onto/into the work is a little like walking a labyrinth or wandering along the inside of a chambered nautilus. For me, it was a contemplative, solitary experience. 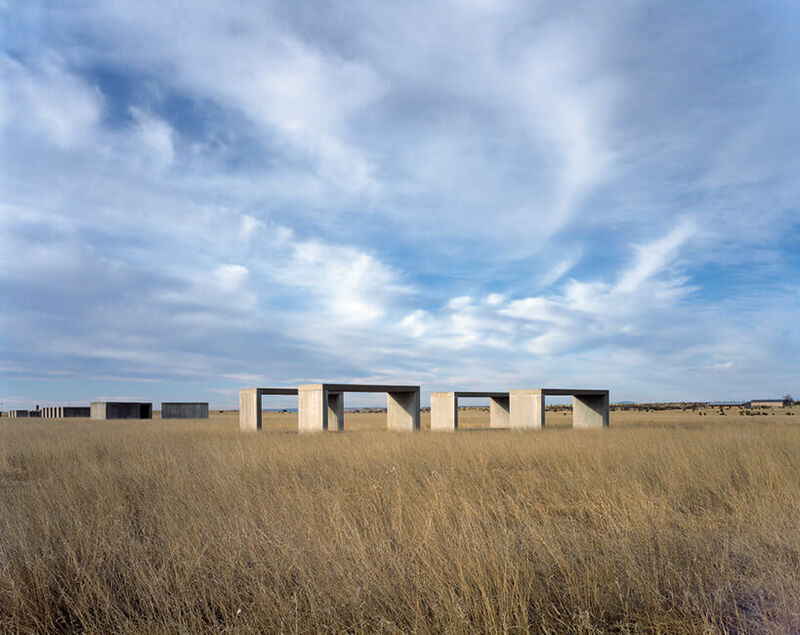 Viewing Judd’s work outside of the white cube is a little disconcerting at first, but seeing his concrete geometric forms placed on the low, grassy Texas landscape reminded me of a modern Stonehedge. These undulating, grassy mounds are so high that I actually felt like I was floating between waves in the ocean. I love this Richard Serra sculpture. 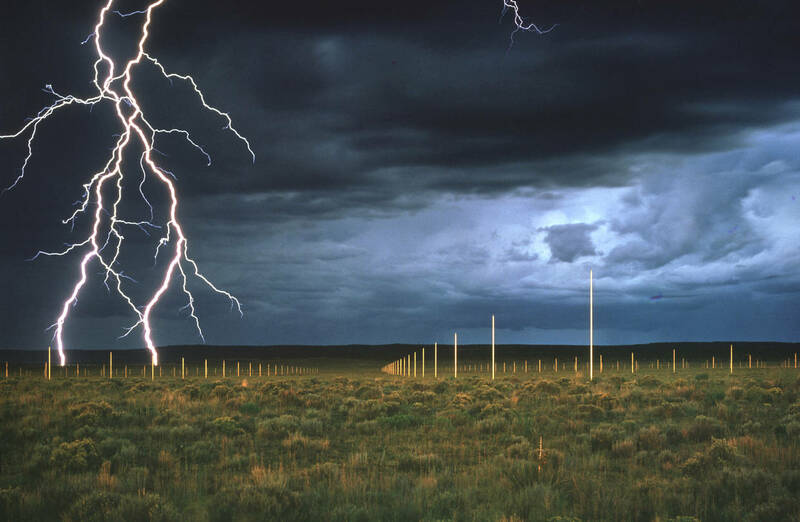 Previously, I had only seen Serra’s free-standing work inside museums and galleries. To see these beautiful cor-ten steel pieces in the open is to witness art merging with the natural world. 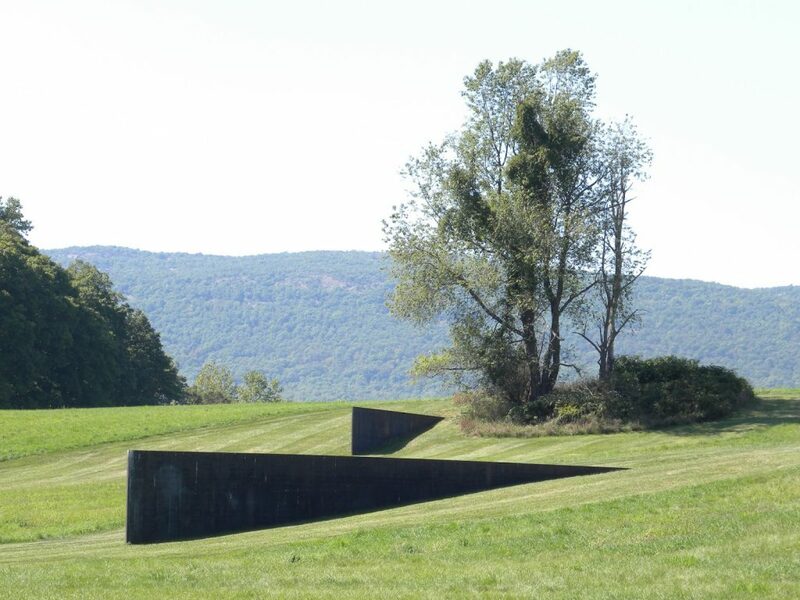 The steel punctures the rolling fields at Storm King to emphasize the various drop offs in the landscape. It’s very unexpected and thought provoking. 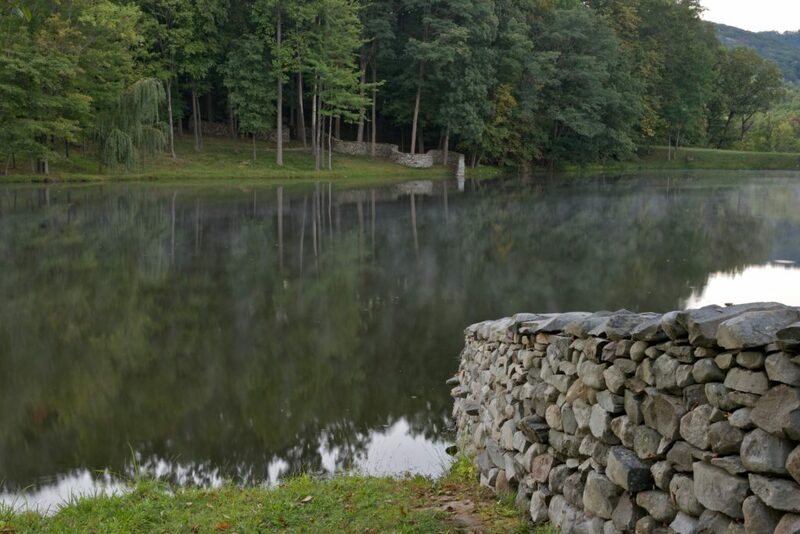 Years ago, on my first trip to Storm King, I saw Andy Goldsworthy’s Storm King Wall. 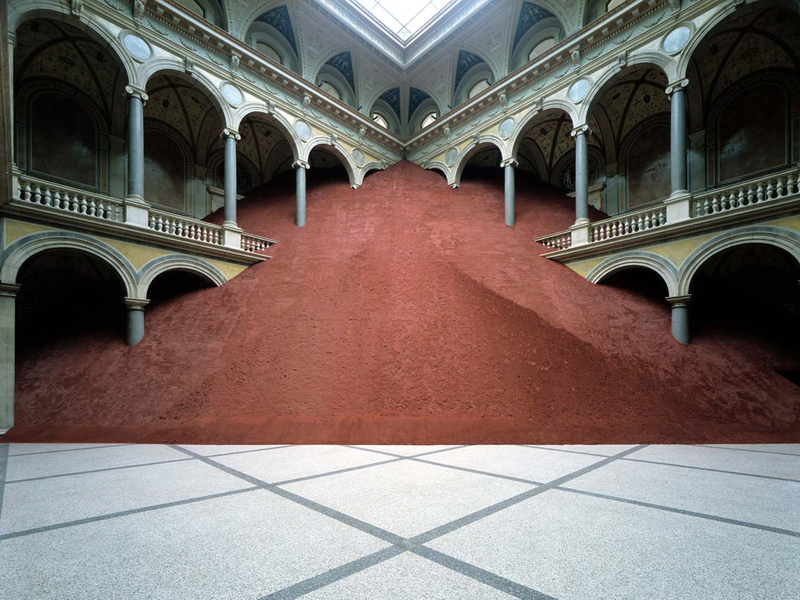 Previously, I had only seen Goldsworthy’s work in films and books. This lovely serpentine rock wall winds itself, like a snake, through a grove of dense trees into, under and through a small pond to emerge on the other side and continue its ascent upward toward the crest of a nearby hill. For me, this is an installation that embraces nature to the fullest and cannot be transferred into a stagnant image. It must be seen in person to be appreciated. 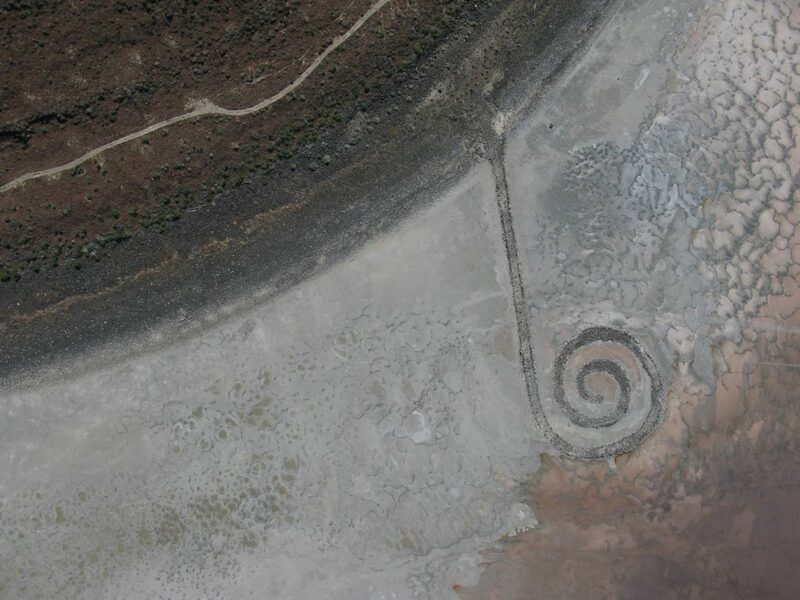 The three sites on the Top 10 that I have not seen, but are on the list, are The Roden Crater, The City, and Sun Tunnels. The first two works have required almost a lifetime of commitment for their respective pièces de résistance. 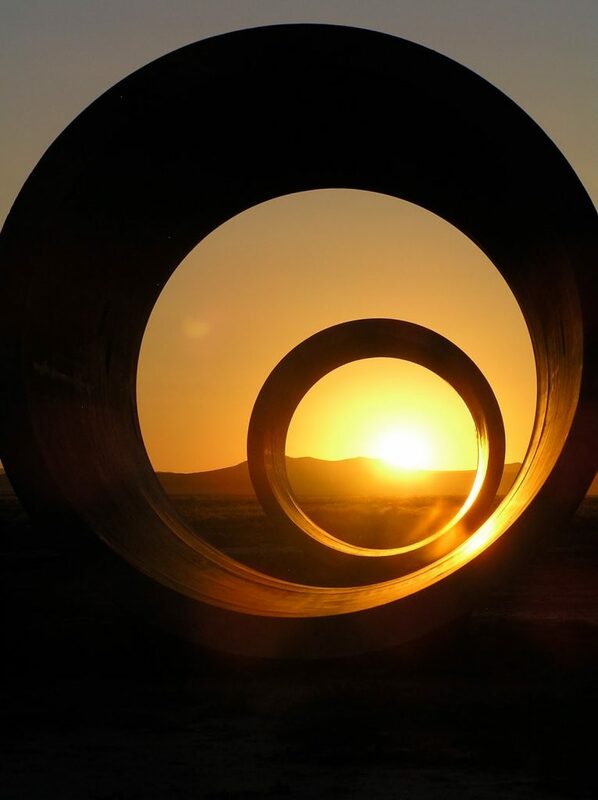 The final artwork on the list is Sun Tunnels by Nancy Holt which took Holt three years to complete. It is currently open to the public, unfortunately, Holt died shortly after this work was completed. This project began in 1972 and is scheduled to be completed in 2020. Check out our Instagram and Facebook page as we highlight specific parts of the listing. 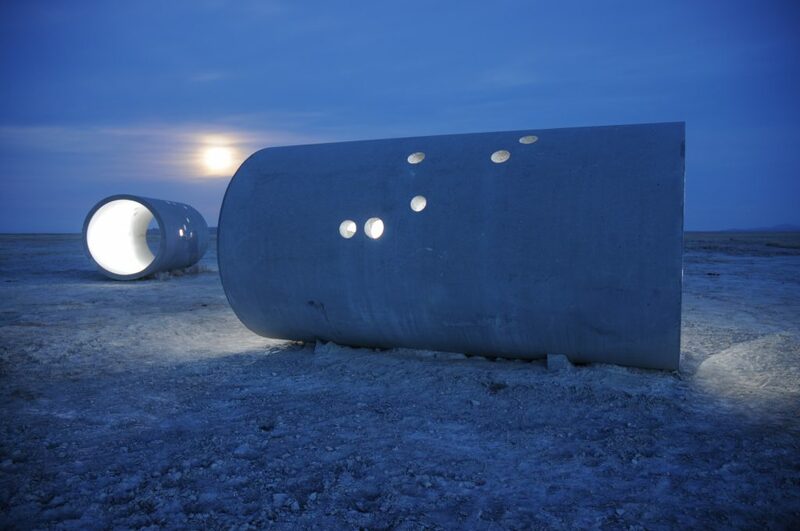 Tell us about your favorite earthworks, environment and land art using the #whitespacetop10. This entry was posted in Uncategorized on February 9, 2017 by blog814. The Atlanta- and San Francisco-based photographer and writer Matthew Terrell currently has his sensual second show, “The Exquisite Corpse of Film Photography,” featured in Whitespec. I sat down with Terrell on a windy Saturday in mid-November to speak about double exposure, memory, and Surrealism—a conversation frequently interrupted by our fascination with the autumn light and shadow moving across the gallery floor. Nathan Blansett: Your current installation, which is in Whitespec, is a series of photographic works. How did you arrive at the formal process specific to this work? Could you name that process and talk about what it involves? Matthew Terrell: Well, I’ve never really had a nice digital camera, like the Canon and the Nikon, the big ones that everybody uses these days. I’ve always had a Pentax K1000, which I’ve had since high school. So I’ve been shooting film for a very long time and I’ve been keeping it up. 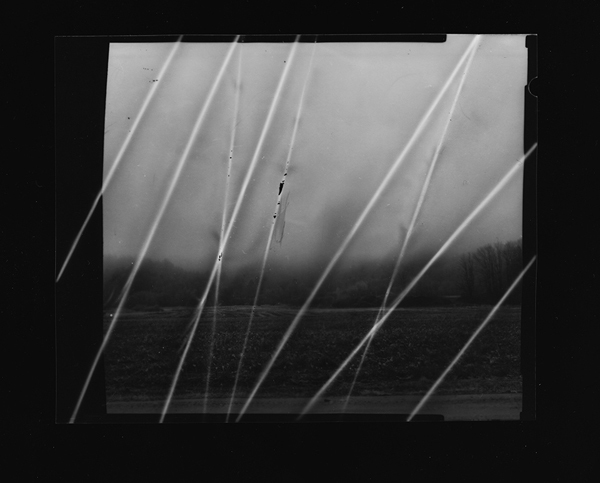 Probably about 2012, something went wrong with the winding mechanism of my camera, and it wasn’t winding the film back all the way, so it was causing some of the images to be double exposed on each other. And I really liked the way that looked—it was such a surprise, and I thought the images were just so dynamic and so interesting that I decided to recreate it myself. And at the time I also really wanted to take a lot of pictures but couldn’t really afford to use up a lot of film, and so if you double expose film, it’s a way to take twice as many pictures [laughs] and only pay for one roll of film, which is a really silly thing to think about, but it lets me take more pictures. So it really just developed as a fun practice, a way for me to develop my skills. I really think about just what is the most beautiful thing that I can take a picture of. How can I frame it, crop it, light it, in order to bring it to its…whatever it is. Whether it’s a fire hydrant or a Corvette or a Schnauzer—how can I take the most perfect picture of it, knowing that it’s going to get double exposed over, so I don’t really know what it’s going to look like […] and that’s freeing. It allows for some play and some fun and I’ve kept it up ever since. I think what’s really fun about it—what you see in this show—is that they end up basically being long strips of continuously double exposed images. So I get to scan those long strips and print them like that, which is really interesting. […] You don’t see a lot of that. NB: How do you think that complements the thematic aspects of work? MT: I think that it’s really interesting to see it the way it’s printed, because I’ve got it with the frame breaks, I’ve got it with the sprocket holes and it’s got numbers on it, so it almost looks like a movie reel. I call them little cinematic stories. It shows the process because you’re really seeing my progression, usually on foot, through an area as I’m exploring a subject—whether it’s like the Dogpatch neighborhood of San Francisco or if I’m just spending an afternoon with my friend Brigitte Bidet. You get to see all those sorts of things that I see through my lens as I progress through it because it really doesn’t matter the order in which I see it, because you see it in the order on the strips of film. But then you see two different moments exposed over each other. I would almost compare it to, like, you’re going on vacation, and you have these memories of, “I did these series of things in one afternoon and I did these other series of things in one afternoon,” but everything kind of starts to blend together in your memory. NB: Yeah, memory is not that linear. MT: Yeah, it’s linear and not linear at the same time. It’s reflective of the way that I kind of remember things. Both series and things start to blur together. So that’s a reflection of what’s going on inside my mind as well. With these images here […] sometimes I’ll add color lenses or prism lenses to my camera, but I didn’t in this show. These are all pretty straightforward. The composites that you see, they are taken directly from the strips of film. I’m not going into Photoshop and laying them over. Pretty much it’s just scanning them and doing a little color correction, and then sending them to the printer. NB: I’m curious as to who your direct influences are—not just for this work, but as an artist, who you’re turning to, who you think is informing your work and your process? MT: Definitely Arthur Tress. He’s actually a friend of mine, and I was actually with him when I was shooting some of these photos. He is what I would call a “surrealist documentary street photographer.” He had actually encouraged me to print the work like this and have a show like this, with the long strips of film, with the sprocket holes and everything. So he’s definitely my first influence. When you look at Arthur Tress’ work, there’s definitely a surreal undertone to it. He’s got a very surreal photographic eye. And Keith Haring—he’s just a really awesome artist. I don’t know thematically or technically what kind of an influence he has on me, but whenever I see a Keith Haring piece of art, I’ll photograph it, and there’s actually two separate pieces in [“The Exquisite Corpse of Film Photography”] that have Keith Haring objects in them. One’s got the Keith Haring altarpiece from Grace Cathedral, and another is Dancing Figures, which was in front of the de Young in San Francisco. Duane Michals, for sure. He came actually for Atlanta Celebrates Photography, and I regret not getting tickets. But he’s definitely a photographer that I look at because he actually has series of images that tell a story, like four images in a set that tell a story. And I think about that sometimes when I’m choosing images—how does the progression of what I show tell a story somehow? NB: How would you see your work, not just this project but your work as a whole, engaging with a particular tradition in visual art, not just photography, perhaps a queer tradition or an aesthetic one? MT: You know I think I’m definitely a Surrealist. Surrealism is not taught right now, but it comes and goes in waves every once and awhile. I think we’re actually kind of due for a new wave of Surrealism. I feel like with photography right now, it’s what I call “hyperrealistic documentary photography”—it’s very political, very theoretical, very theme-driven. But what I’m interested in with Surrealist photography, it’s really about the process, it’s really about the aesthetics of it; making, for me, something that’s just beautiful to look at, something that’s interesting to look at. When you look at a Surrealist work, it’s really interesting because you can look at it time and time again and see something new every single time. That’s something that I want in my own work. I will walk by the photos and notice little details that I have never noticed before. I find that a very interesting quality for artwork. I find it something that makes me want to enjoy it and produce work like that more. Definitely, I look back more towards older photographers. Both Duane Michals and Arthur Tress are queer photographers from the ‘60s and ‘70s who did black and white and traditional photography. So I think there’s definitely some queer and classic influences in there. I’m very interested in the artisanal archival analogue processes, simply because they’re just different—and this is a silly thing to say, but even though you know it’s really expensive for me to do it, when I pay to have [the work] developed, I get prints back. So I have prints of everything I’ve done. And I know a lot of photographers who have fancy digital cameras and they don’t have a single print. I’ve got scrapbooks, thirty scrapbooks on my shelves of photos, and boxes and boxes of prints. It’s really important for me to actually have the item, for the item to exist not just digitally, not just on my computer, but in some sort of real world context. NB: Absolutely—it’s an object, not just a file. MT: Yeah. I’ve always been someone who very much values giving people prints. Usually at the end of every year, I do this huge project where I will go through all my photos from that year and pull out the ones that I want to give to people. I have, like, all these giant piles, “Camille” and “Ted” and “Jason.” I go through hundreds of photos and sort them out and I’ll sign them all on the back, and I really try and label them all on the back as well. So I’ll say when it was taken, what it is, where it is. That’s usually my Christmas gift for the year. That’s another reason that I do film-based photography, because I get to do that. I’m always really surprised by the different things people pick up on, the different things people are drawn to. Different people like the words “Hot Cookie,” different people like some sections that are more formalistic, they’ve got ferns and fountains on them, they have very strong lines. Some people really like that because it’s more graphical. Some people like the more soft elements, like the candles. I think that part of the fun of the process is that I sort of get to allow graphic elements and soft elements, things of design and things of color and shape, all these things that—you know, if I was just what I would call a “straight photographer,” just regular photography, you might not get to play with all those different elements in one. But in this case, in these photos, you can have all of them, all the different elements. So there’s something for everybody. That’s something I like—something for everybody and you can constantly look at it and find something new. That’s really fun. 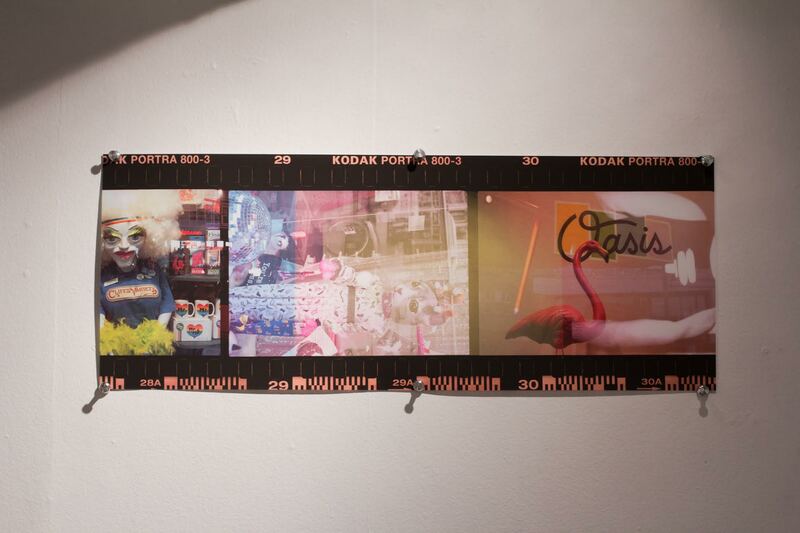 Matthew Terrell’s “The Exquisite Corpse of Film Photography” is at Whitespec through Saturday, November 26. This entry was posted in art exhibition, Atlanta, Uncategorized, whitespace, whitespace gallery on November 19, 2016 by blog814. Seana Reilly’s latest show at whitespace is a cross between a library and a church, temple, or cathedral. With gothic and other architectural influences, Eastern and Western religious motifs and a quieting quality, Docking on the Orphic Shore is reverential. For this blogpost, we decided to interview Seana to get a better understanding of the materials, her process and the creation of the show in whitespace. Hilleary: Your show feels absolutely sacred and spiritual. Docking on the Orphic Shore is a representation of that place we all seem to be trying to get to, whether it is heaven in Judeo-Christian religions, or Nirvana in Buddhism, the Orphic Shore seems to be that place as well. Seana: It’s about trying to lose your edges and connect with something larger than yourself. It expands outward beyond the physical limits of your body. Sometimes religions will help people do that. Sometimes science with its endlessly evolving frontiers can help people get there. Poetry can as well. There are so many different paths – it’s whichever suits you as an individual. 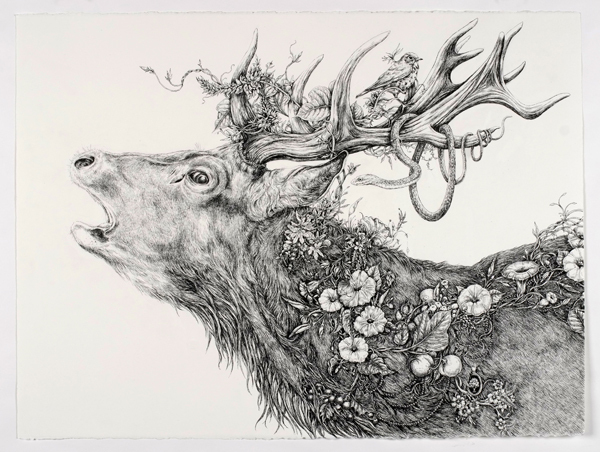 One expression for me of this dissolution of the self is in the piece titled OrphicSonnet. It’s a transcribed Rilke poem – as I moved down the surface losing myself in the writing, three lines behind me the words were starting to migrate and change, losing themselves. Once the piece was done I found it kind of interesting that the image was very recognizable as text-based, but at the same time completely unreadable, illegible. I don’t think you can put this larger experience into words, so it’s rather fitting. H: You and I have spoken about the materials before, but how would you describe working with them and your process? S: My process is more participatory practice than ritual. It’s a communion of sorts. I’m always trying to balance control and chaos. When working with the graphite there are a few things I can control and make decisions about, such as the viscosity, the substrate, or the scale. That’s where my architectural background asserts itself… the defined space, the pristine edge, the square format. But once those decisions are made and the material is released into that framework, I surrender control. The graphite can be prodded a bit – in the service of broad aesthetic decisions – but it has certain inherent qualities that produce particular kinds of affects or patterns. This is what fascinates me… how the material mimics planetary-scale processes in nature. Some of the works read as landscapes, but any representational aspects of the work are accidental and unbidden. I neither erase nor encourage these. More than anything I’m intrigued by them. H: What about the gray walls in that room? How did you decide to create that as part of the exhibition? S: The two rooms are different. Works in both spaces are graphite, but graphite in two different forms and applied in two different ways. I kept all the tactile hands-on paste graphite in the first room because I wanted a grounded place to enter into first. 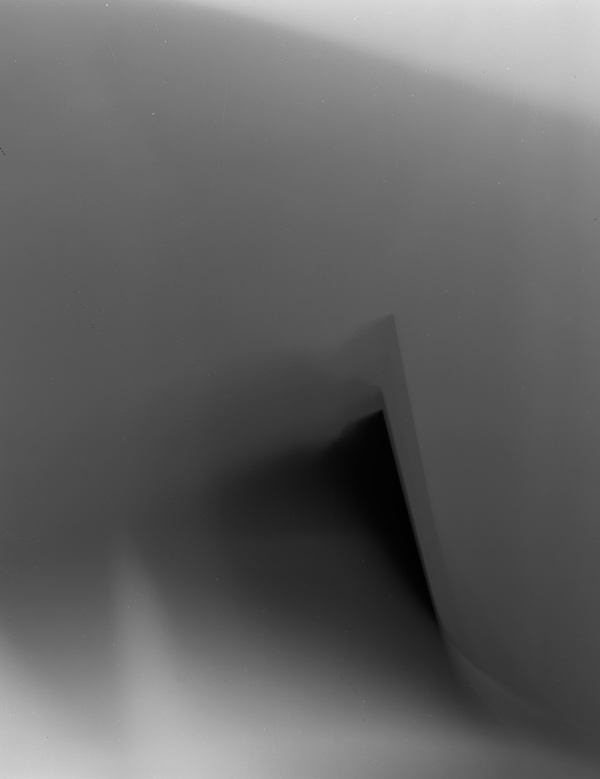 It’s also a very bright white room and sets up a contrast with the other darker space with the liquid graphite pieces. It’s markedly different when you step up and across that threshold into the room with the books. In thinking about this room I kept coming back to both a sense of drama and stillness. I spent some time at the Carlos Museum. They do it well – I think it’s all in the value shifts in color & lighting. I chose the mid-value grey walls to tone down the space energetically, and in a practical sense it helps to set off the white portions of the works which get lost on white walls. H: There is a rhythm to the whole space something that ties it together as a whole, could you speak on to that? S: Obviously, there’s consistency of palette and material. That helps. I also like working in series, so there’s a rhythm built into that. There’s a consistency of presentation as well. The series of vertical paintings between the books, for example, sets up a repeating rhythm that leans toward religious architecture and also toward museum presentations of ancient tablets and scrolls. Then you intersperse the books, also done in series… Books of this size are usually reserved for deep records of knowledge or spiritual guidance, so they lend a certain weightiness to the room, both visually and atmospherically. The intent and presentation is consistent. At least that’s what I was shooting for. One other thing that may help is the continuity of visual language throughout the show. 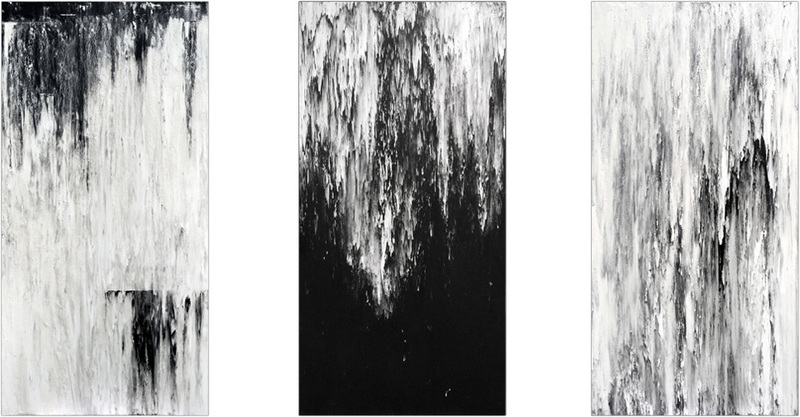 Every piece in the show is an expression of the way the earth was formed – not in some abstract way, but a physical manifestation of the laws of gravity and fluid motion. The books are not full of alphanumeric symbols or pictorial allegories pointing to things outside of themselves. They are full of nature itself, as are the paintings. This entry was posted in Seana Reilly and tagged atlanta art, whitespace, whitespace gallery on October 21, 2016 by blog814.